There are 8 reviews of Clémentine California. The famous Atelier burst of citrus, followed by a combo of juniper scents right it of 1980s Cali. This is a wonderful scent to represent the West Cost and especially Southern California. After a burst of orange, the juniper appears and stays for the journey. As another reviewer notes it’s reminiscent of Geoffrey Bean Grey Flannel, only less musky, more citrus. I see it as a continuum where 80s Grey Flannel is on one end and 80s Ralph Lauren’s “Lauren” is on the other. Juniper with a healthy floral citrus blend. It’s very intriguing. Sweet but unisex, guys can pull it off on a hot day in a tee and jeans no problem. What a shame! This opens up so nice, and vibrant. Bought a sample of it finally, it's been on my test list for a bit. I see where people say it's overly feminine, because after about 5 minutes, it sways that way, but I still liked it, until.. I go to smell my hand and hour later, and it turned into something just bad. It doesn't smell like any citrus, and it doesn't even smell floral anymore. Just kinda smells like rubber, Chlorox, and some type of dog shampoo.. disgusting, yet intriguing. Yet not worth the price, even on sale. A slightly fruity fragrance that has a nice mandarine note that gives it that freshly cut Orange vibe. Projection and Longevity are average. The darkness in this one helps it to be a decent unisex fragrance for the Spring. I got the Atelier sampler and was very excited to try this one. I knew almost all are considered unisex so as I was decanting the samples into a spray bottle, any that I felt didn't suit me I gave to my wife. This is the one that I love the most on her. It's sweet, fresh, clean and flirty while also smelling rich, natural and decadent. I asked her each time she wore it, "that one, what is it?". I find it to be intoxicating. There are seven and a half billion people on this planet, and Atelier Cologne has released nearly that many citrus fragrances. But this is the one that says California on the bottle and feels like it on the inside. This is the one whose opening makes me smile brightest. This is the one that makes me think of citrus groves bathed in golden light, of backyard tangerine trees, of bags of oranges sold on freeway offramps. It's bittersweet. It's optimism tinged with nostalgia. It's like Huell Howser on California's Gold: a good-natured and a comfortable companion. I don't know if it's the best citrus fragrance on the market, but I do know that it feels right for me, and it feels like the perfect thing to throw on year-round in Southern California. Atelier Cologne Clementine California Cologne Absolue Pure Perfume 3.4 oz. There are no member images of Clémentine California yet. Why not be the first? 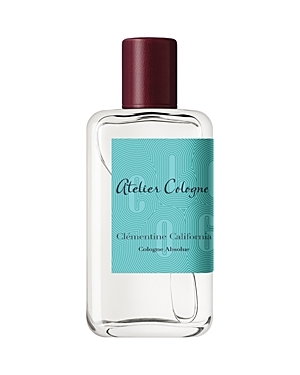 New: Clementine California from Atelier Cologne!